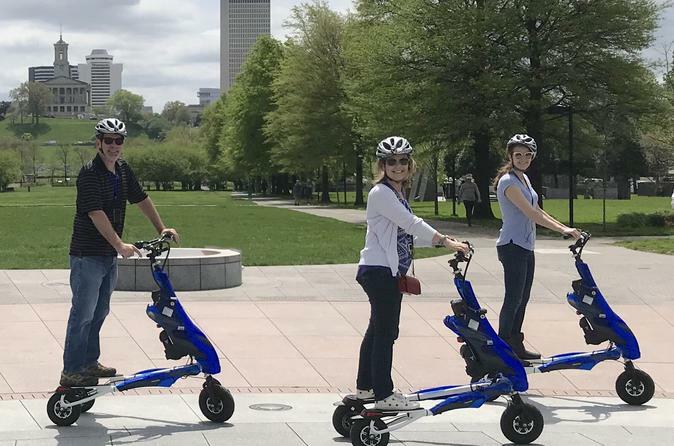 Your electric Trikke tour lets you glide through Nashville's Riverfront Park, Bicentennial Mall, the Farmer's Market, Sounds Stadium, the State Capital, Country Music Walk of Fame, and the sights and sounds of Broadway! Enjoy a unique outdoor experience on your stable, quiet, and comfortable 3-wheeled electric vehicle - perfectly designed for touring! The unique electric-powered carving vehicles can do it all for you, or offer a little light exercise along the way. An active and fun way to experience Nashville's most interesting sites! Breeze along on a fun and adventurous tour of Music City you will never forget! After a 15-minute orientation and training, you'll feel comfortable on your electric-powered, zero-carbon-footprint vehicle. Your guide will provide a helmet and wireless earpiece, so that you can enjoy narration of sites along the journey. You'll pilot your electric Trikke along a 2-hour fun adventure, mostly along sidewalks and pathways that visit Bicentennial Mall, the Farmer's Market, Sounds Stadium, the River front, Fort Nashborough, the Downtown Broadway District, Riverfront Park, Ascend Ampitheatre, Schemmerhorn Auditorium, Country Music Hall of Fame, Walk of Fame, the State Capital grounds and more. Along the way, you'll hear about some of Nashville's history and culture, and you'll stop for photo-ops and perhaps a brief snack or drink (at your expense). Trikkes are unique vehicles which have the ability to "carve" or use body motion, much like skiing, to enhance the experience and add an active element to the ride, however, many guests prefer a completely powered ride, and no carving is necessary. A hook is provided for a small purse, or bag. Tours operate in light rain, with ponchos provided. Please wear closed-toe shoes and dress for the weather. IMPORTANT: Guests must weight no more than 260 lbs. Guests under 16 years of age are not allowed, nor are guests who are pregnant or under the influence of drugs or alcohol. Proof of age or weight may be required. No refunds will be made for guests arriving under the influence of drugs or alcohol, or who are not within the age or weight limits. Exceeding the weight limit will damage the Trikke and put the rider at risk. Your guide will have discretion to refuse service to any guest who cannot provide documentation, or who, at their sole discretion, appears to be intoxicated.